I was under the assumption that oven is only for baking cakes and bakes till I started a food blog. My notion changed completely when I came across different food blogs world wide. Initially I started making tikka in oven using paneer and chicken. Slowly I moved on and started baking regularly using oven and I found this method to be a healthy alternative. 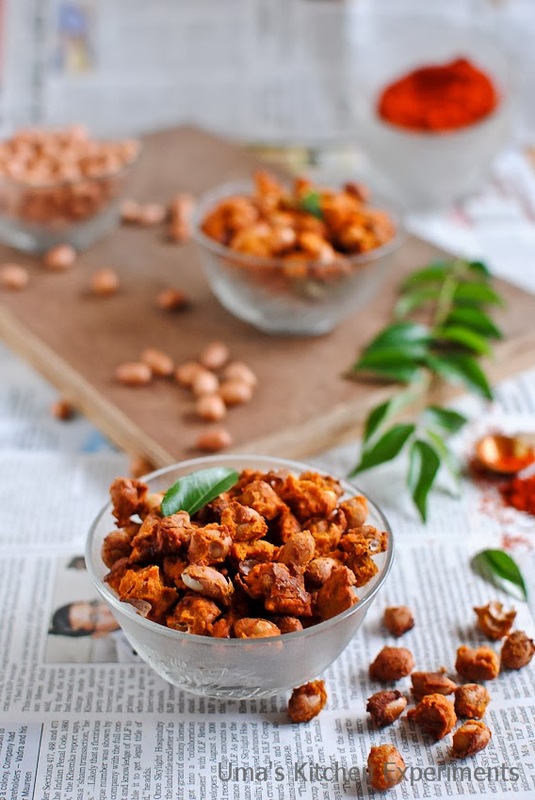 Baked masala peanuts is one such healthy baked recipe. 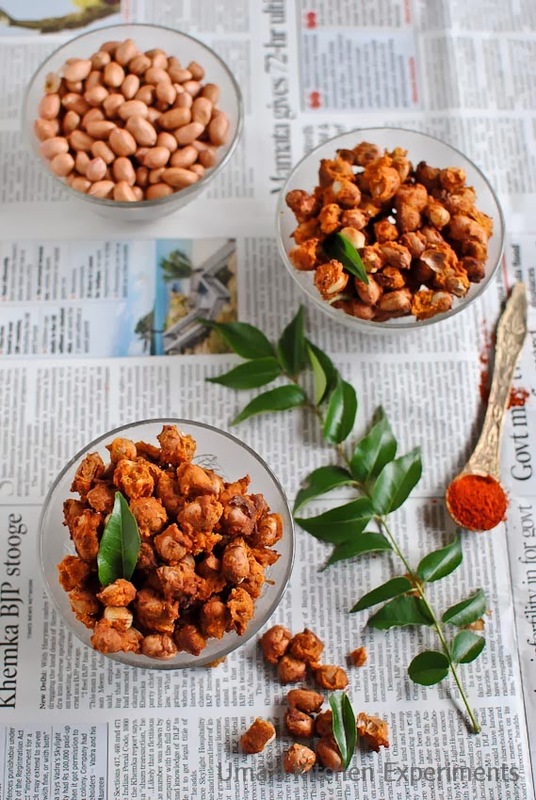 Masala peanuts is one of my favorite childhood snacks and during those days, my mom used to buy this from a known neighborhood shop which uses good quality of peanuts. 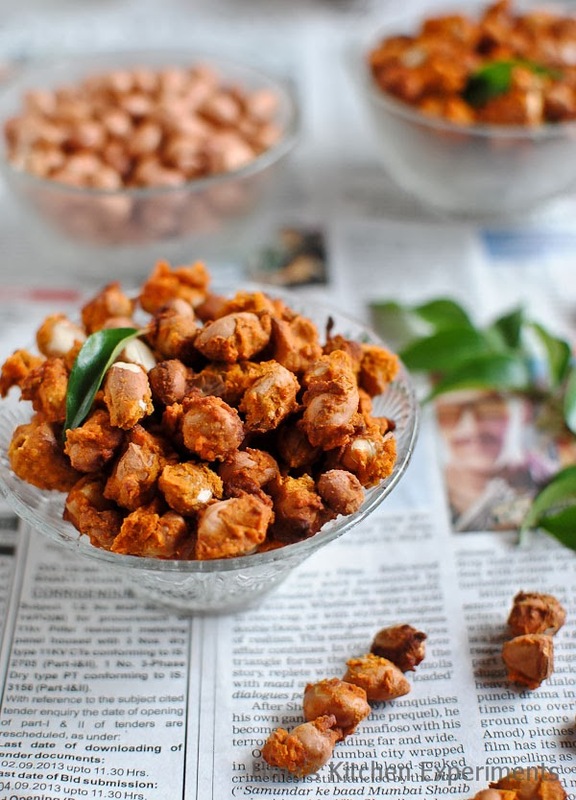 But after moving to Chennai, I stopped buying this from shops outside since I couldn't assess how good the peanuts are...So, whenever I get good quality peanuts I prepare this recipe often. Very addictive snack and hence picked the baking option. It tasted as good as fried one. 1) Preheat the oven to 200 degree C for 10 minutes. 2) Meanwhile wash the raw peanuts and drain the water completely. Peanuts should look moist and not watery after draining the water. 3) I used garlic cloves and cumin seeds and ground them as a paste. In another plate, Add all the other ingredients except water. Mix well. 4) Add the mixed ingredients and ground paste to the moist peanuts. 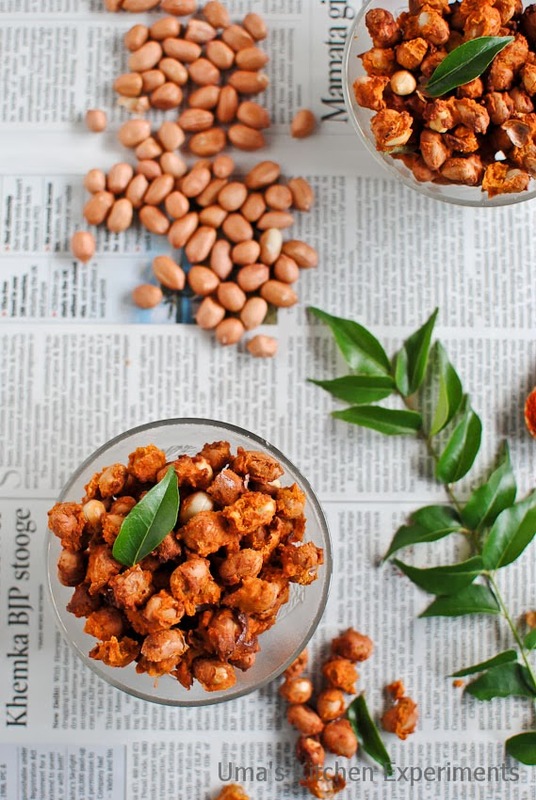 5) Add 1 tablespoons of water at a time and make stiff and thick peanut masala mixture. You may need 1 or 2 tablespoons based on the brand of chickpea flour. Sometimes you may not require water itself and the moist in the chickpeas would do a great job. 6) Spread it evenly in the baking tray lined with butter paper / parchment paper/ aluminum foil. Drizzle with the remaining oil. If you are not doing this step properly, then peanuts will cling to each other and it may not cook evenly. Throw curry leaves. 7) Bake it for 10-12 minutes or until the peanuts become crisp and baked well. 8) It becomes more crisp and crunchy when cooled down. 1) I skipped food colour and added kashmiri red chilli powder for bright red colour. You can go with either of these two. 2) You can skip garlic and cumin seeds for garlic free version. But these two ingredients add nice flavor to the peanuts. 3) Use good quality peanuts. 4) Adjust the spice and salt level as per ones preference. Very healthy option......even i make peanut pakoras regularly!! Will use my oven the next time i prepare a batch!! Happy New Year!! Masalas are very well coated n Happy New Year!!! Love this healthy and crunchy snack!